Happy New Year! I still can’t believe that we are already in 2018. And I know I’m saying that for every new month. But it’s still crazy how time flies! 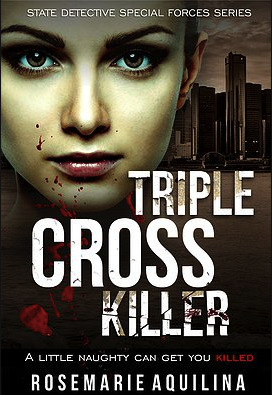 Today is my stop for the Triple Cross Killer blog tour by Rosemarie Aquilina. The Thriller genre is definitely a genre that I like to read. So I tend to be a little bit picky about books in that specific genre. Triple Cross Killer by Rosemarie Aquilina definitely did not fail my test. I liked it a lot and it kept me entertained the whole time. It is written in a few perspectives: three to be exact. The killer, a nurse and cops. And the story takes place during the Christmas time. (Which is probably only a plus and amazing for a Christmas lover like me xD) It’s clearly no book that is fast-paced, there are a few murders happening very fast one after the other but the cops don’t have a clue on a potential criminal. While the reader knows who the mass murderer is the other protagonists only find it out until the end. Which on one hand can be a little bit frustrating, to be honest, as you know who it is and you just want to shout at the police who the hell is the criminal but you can’t. On the other hand however it is realistic. In real life, the police don’t find the criminals after a few hours. It takes time and this book portrays the reality. Something I like but I don’t read very often. I recommend this book to every lover of the thriller/mystery genre. You will definitely not be disappointed. Go and give this book a try! in 2006 with twenty years Honorable Service. She is an adjunct law professor at both Western Michigan University—Thomas M. Cooley Law School and Michigan State University College of Law and has earned teaching awards at both institutions. Judge Aquilina is the former owner of Aquilina Law Firm, PLC, and former host of a syndicated radio talk show called Ask the Family Lawyer. Have you read Triple Cross Killer by Rosemarie Aquilina? What did you think about this book? Or do you plan to read it? Please let me know in the comments below! * This book was sent to me by the publisher in exchange for an honest review! Thank you to Fiery Seas Publishing! I am riveted to this book. I barely put it down except the holidays got in the way. The author grabs you from the beginning as she did her previous book. I am not usually a book reader. But this author seems to get me and my liking for realistic mysteries. Make this book part of your reading or even a book club read. The discussion will be interesting. No, I’ve written the review on my own. Nobody wrote anything for me! All the words are my own!